I’m going to assume that you have been able to sign-up for Zoho CRM and that you can reasonably manage through setting your default values in the “Setup” menu of Zoho. Also, for those of you that don’t know anything about Zoho CRM, view a previous post Zoho CRM for Lead Management. This guide is to give you a quick run-down of the major lead types and flow of one type of lead to another. Zoho is broken up into 3 main categories for Lead Management: Leads, Potentials, Contacts/Accounts. These are not existing customers. 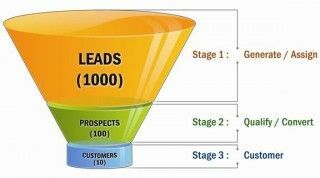 These are leads that come in from your website, by phone, referral or other marketing that are not qualified. This is where you can set your lead status, create notes on when you talked to them and details of the conversation, attach files and emails, and create tasks for follow-up or other activities. This is also where you can reassign leads to other sales people or mark a lead as dead if it’s not going anywhere. When you have a reasonable expectation that this lead can become a customer, you will “Convert” the lead to a Potential by clicking on the Convert button. 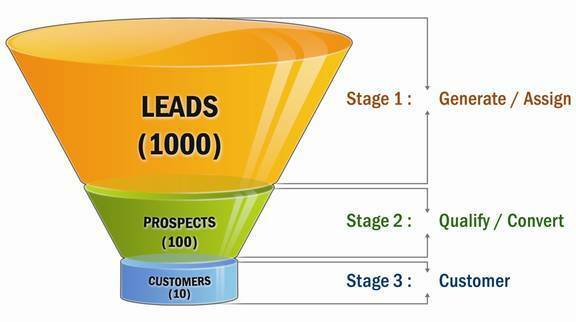 Once you convert a Lead to a Potential (or add one in right away as a Potential), you have to set the stage of the sales process that you’re at: Prospecting, Qualification, Needs Analysis, Value Proposition, etc. By selecting the stage, a percentage is assigned to the potential that represents the probability that the sale will close and you will convert the potential into a customer. I have found the Stages to be reasonable for what I do but you can always change the stages and assign different percentages to each. You also set the Expected Revenue and the Close Month of the sale. This helps to forecast revenue using the percentage to close and the revenue. Once you close the potential, you Convert them to a Contact. Accounts are your customers at a company level (i.e. Acme, Corp). Contacts are the employees that you talk to within that company. You can have many Contacts per company, which is nice for consolidating data and allowing for multiple salespeople to have their own Contacts at the same company. You won’t create a lead from your Contacts because they’re already customers but when you’re working a sale with the Contact, you can create a Potential and assign that Contact to the Potential (right on the Create Potential form). I have a couple of quick tips that you can use to make your Zoho CRM experience a little better. On each view (Leads, Potentials, Contacts, etc.) you can click on the “View” drop-down to select or customize a different view. This is then set as default so you can easily change it to show something like all of your open leads only. You can add custom fields and add/change values in drop-downs for every field. Go to the Setup menu item and select the type you want to edit. You can create a web-to-lead form to automatically add leads from your website and through their API (Application Programming Interface), you can integrate it into your existing contact forms, which we have used with great success. With the Professional edition, you can create Workflow rules that automatically assign a lead to a sales person based on a set of rules. You can always assign a lead or other type to another sales person by going to that lead and clicking on edit Owner. how should one manage single lead converting to multiple opportunities or potential in zoho ? When you convert a lead, it will create an Account (for the company), a Contact (for the lead), and a Potential (for the potential sale). The lead will now be a Contact. An Account can have multiple Contacts and can have multiple Potentials. Therefore, all you need to do to assign multiple Potentials to a Contact/Account is to go to Potentials, add a new Potential, and assign it to the Account. I have one question – in your article, your statements give me the feeling that the conversion process can happen twice, and step-by-step. Lead -> Potential -> Contact/Account. I love that part. Problem is, in Zoho CRM, I don’t see it as such. Converting happens once, and that too Lead -> Potential/Contact/Account. If I choose that I don’t want to convert to Contact/Account (because I plan to do it at a later stage – in line with my b2c requirement), it doesn’t let me convert to potential either. Finally, I’m unable to “convert” a potential. A few things have changed with Zoho CRM since I wrote this but I think they’re for the better. You can’t convert a Lead to a Potential then to a contact. If you create a Potential or convert a Lead, a Potential/Account/Contact are created. While this works for business that we work with, it may not work well for you. Creating an Account and a Contact for each potential works out well when you’re doing conventional and in-person sales but not as well with online or information marketing. In this case, I believe the Potential aspect is really not used. If you don’t have an additional qualification step between Lead and Sale, you don’t need a Potential. If you do, you may end up with a bunch of Accounts/Contacts/Potentials that never become customers. This is where setting “Stage” becomes important so you can sort through them all. Yeah, or so I hoped. Our business is about giving microloans. First process is lead, then during potential stage they are required to send in paperworks, etc. And upon final approval, we give the loan and that’s when they become a client. What do I do with a potential once it’s marked as “Closed Won” – I’d think it’s technically not a potential at that point. Do I delete it, or is there a way to archive it and get it out of the potentials list (without losing the historical data)? If you delete the potential, you’re going to lose the historical data related to that potential (i.e. different stages you went through and notes). If you’re worried about having all of these “Closed” potentials cluttering up your potentials list, try creating a new view (hover to the right of the “All Potentials” drop-down) and filter out the Closed potentials. I want to be able to see lost potentials (so we have accurate numbers to be able to see 10 proposals/potentials yielded 5 sales for example), but the problem I have is now they are all accounts…I REALLY don’t want lost potentials showing in the accounts, but would like historical data for that…Any suggestions?